I watch crappy movies so you don't have to. It's Thanksgiving week so most movies will be hitting the theaters on Wednesday instead of Friday. Enjoy! 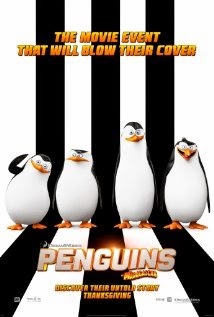 Plot: The penguins must team up with another elite force to try to stop a villain from kidnapping the world's penguins. This may well be the funniest animated movie of 2014. I laughed out loud 15 or 20 times and spent the better part of the rest of the film trying to wipe the smile off my face with no luck. Kids will love this movie because it has a lot of fun elements for them, but adults will be just as pleased with it because it has an interesting plot, surprisingly in-depth character development, and it is fast-paced. I put this movie up with the likes of THE LEGO MOVIE and MR. PEABODY AND SHERMAN. This has been an incredible year for animated films and PENGUINS keeps the streak alive. Plot: After their business is sabotaged, three guys come up with a plan to get their money back, but their plan gets hijacked by a scheming sleazeball. The original HORRIBLE BOSSES was a raunchy, hysterically awesome movie. HORRIBLE BOSSES 2 is the same. My jaw hurt when I left the theater after this movie, but I also felt like I needed a shower. This movie is so raunchy they couldn't even make a 2-minute trailer without several cuss words in it. As with any comedy, the movie may be funny but it's only as good as its plot. In this case, the plot is outstanding. Sure, it has a few minor holes, but nothing that will hurt your head. It's fun and funny, but with significant moments of suspense and drama. The juxtaposition is what makes this movie so good. If you can handle the offensive humor this is a sequel worth seeing. You can listen to me every weekday morning from 5:30 - 10AM on Mix 92.9 (www.mix929.com) in Nashville, TN. I do the weekly movie reviews every Friday morning at 8:10 and DVD reviews every Tuesday morning at 8:10. You can also see my movie reviews on Nashville's News Channel 2 WKRN Friday mornings. I am also a proud member of the Broadcast Film Critics' Association (www.criticschoice.com). Come check out my adventures as one half of the Nerd Riders duo. Here is our review on INSIDE OUT. Copyright, 2014. Awesome Inc. theme. Theme images by i-bob. Powered by Blogger.